Charlie and Alison have been drawing patterns on coordinate grids. You may want to choose just one to explore or you may like to try all three. Charlie has been drawing squares. What will the coordinates of the centre of square number 3 be? Charlie wants to know where the centre of square number 20 will be. Can you use the diagram above to help you to work this out? 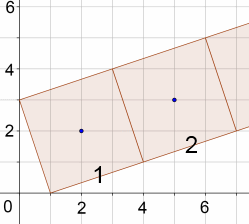 Can you suggest a quick and efficient strategy for working out the coordinates of the centre of any square? Can you adapt your strategy to work out the coordinates of the corners of any square? Alison has been drawing triangles. She wants to know where the vertices of triangle number 23 will be. 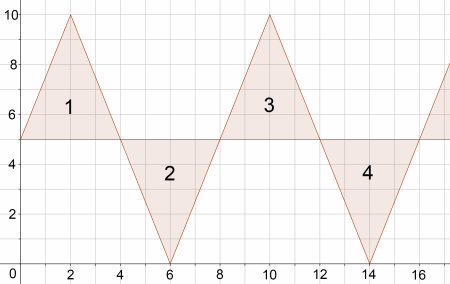 Can you use the diagram to work it out? Can you suggest a quick and efficient strategy for working out the coordinates of the vertices of any triangle? Charlie has been drawing more squares. He wants to know what the coordinates of the centre of square 22b will be. 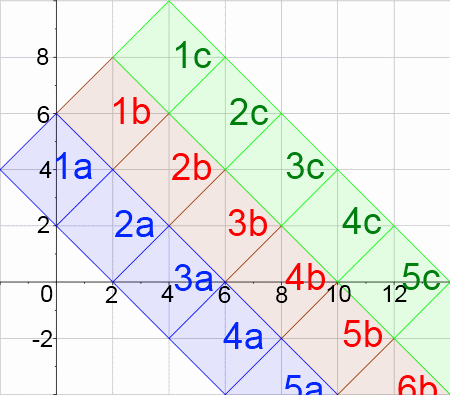 Can you suggest a quick and efficient strategy for working out the coordinates of the vertices of any square? The ideas for these problems originally came from the SMP11-16 booklets on Coordinate Patterns published by CUP. Creating and manipulating expressions and formulae. Visualising. Cubes & cuboids. Interactivities. Games. Working systematically. Generalising. Arithmetic sequences. Mathematical reasoning & proof. Coordinates.